With Reverie, the process of choosing a mattress and foundation becomes simple. Each Sleep System includes a DreamCell™ latex mattress customized to your specific firmness preferences as well as an adjustable bed foundation that allows you to find your most comfortable sleeping and resting position with the touch button. With Reverie, the process of choosing a mattress and foundation becomes simple. Each Sleep System includes a DreamCell™ latex mattress customized to your specific firmness preferences as well as an adjustable bed foundation that allows you to find your most comfortable sleeping and resting position with the touch button. Just answer a few questions about your sleep preferences, and Reverie does all the work to make sure you have the best mattress for your unique needs. It’s that simple. Everything about the Reverie Dream™ Sleep System is designed to help you achieve a deeper, more restorative sleep so that you wake up feeling refreshed, rejuvenated and ready to conquer the day! We know that you and your partner’s sleep needs will change over time, and our adaptable Sleep Systems are engineered to change along with those needs, ensuring that you sleep on your best mattress ever tonight, and for many nights to come. We believe that choosing a mattress is an important decision, and that the best way to decide If a Reverie Sleep System is right for you is in your own home. 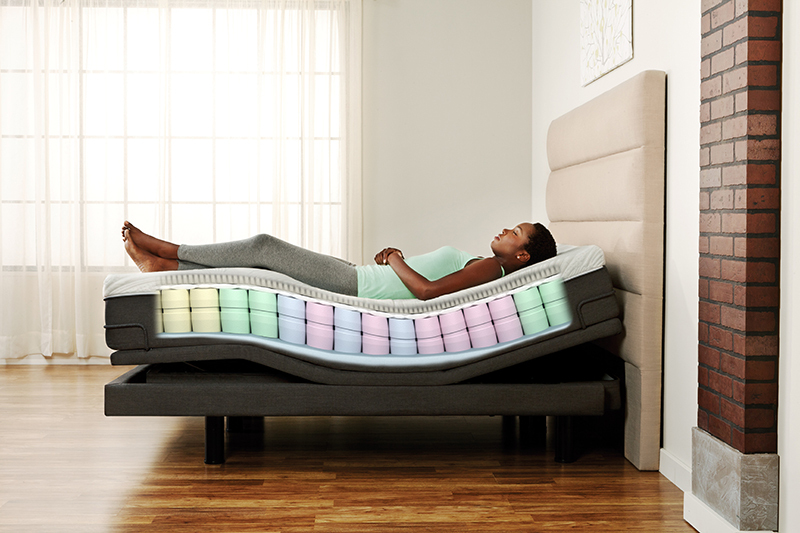 DreamCell™ Mattress Technology provides customized comfort for life. Because customization means more than just “soft” or “firm”, and because your partner’s best mattress is different from your best mattress, Reverie’s DreamCell foam springs come in four different firmness levels that can be configured in an almost infinite number of ways to match you and your partner’s specific firmness preference. Firmness levels vary from extra soft (pink), soft (blue), medium (green), through firm (yellow). 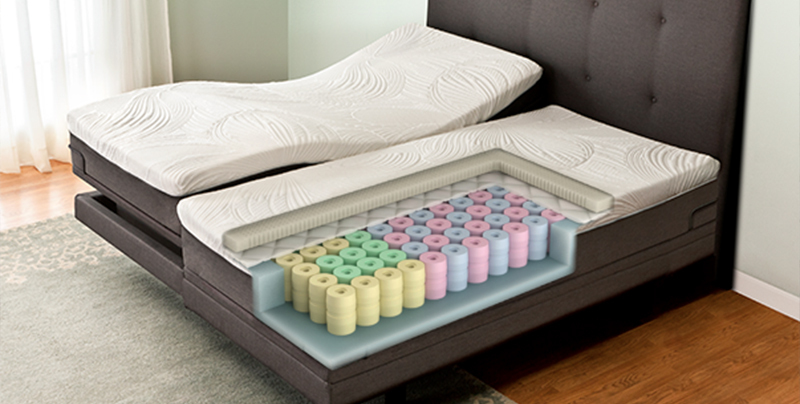 If your sleep preferences change over time, just unzip the mattress and reconfigure the DreamCells easily in minutes. Most people change their sleeping preferences over time, and the Reverie Sleep System adapts with you, so it’s always the best mattress for you. Whether you change from a back to a side sleeper, have an injury or have a life changing event like pregnancy, your bed changes as you do. Sleep soundly knowing it’s natural. Being the best mattress means using the best materials. The DreamCells are made of soft, natural rubber, also known as natural latex. They are breathable, hypoallergenic, anti-microbial, anti-bacterial, dust mite resistant and extremely durable. Reverie’s patented DreamCells provide the ideal support system, and a comfortable, healthy sleep environment. The natural rubber (also known as natural latex) topper and the mattress cover are constructed of natural, breathable, hypoallergenic materials. Ultimate adjustability for unlimited comfort. Reverie’s sleep systems come with an adjustable base that has unlimited head and foot positions that can be adjusted to your liking. With the touch of a button, you control the elevation of your bed so you can sleep, read, watch TV, work on your laptop or relax in comfort. No need for pillows to prop yourself up. 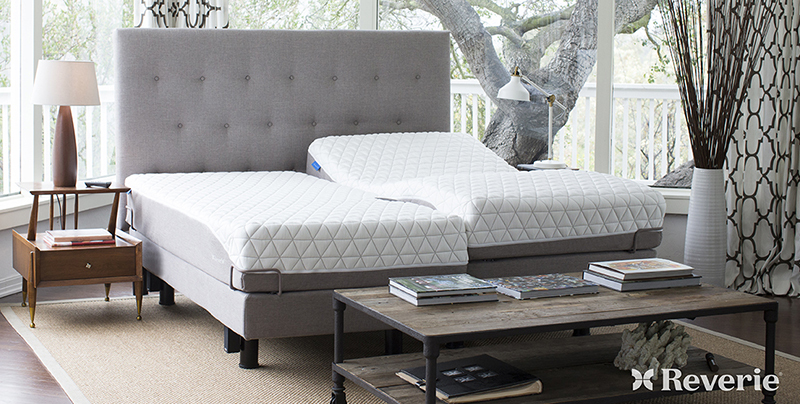 Our Award-Winning Adjustable Power Bases put Reverie Sleep Systems headboard and shoulders above the competition. We believe that your adjustable bed base should be as adaptable as your mattress. While our DreamCells™ maximize customized support, our award-winning Reverie adjustable power bases (also known as adjustable bed frames or adjustable foundations) heighten and enhance that support through personalized positions. From basic head and foot adjustability to massage and smartphone compatibility, you control the precise contours of bed so that you can sleep, read, watch TV, work on your laptop, or unwind in absolute comfort. The best part: you do it all with the touch of a button.